This article is written in English and Japanese. 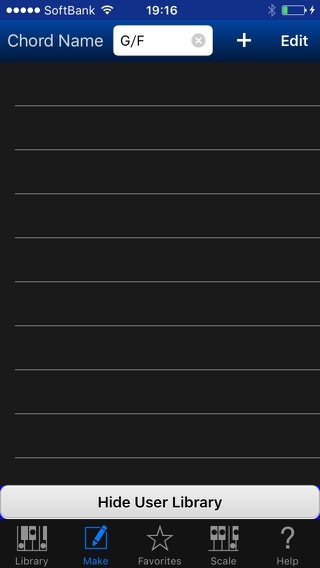 Piano Kit has very huge preset chord forms in Library, but doesn’t have any chord with specific bass note. This is very simple reason, it is the best solution that user choose favorite bass note on the fly. However, it is good idea to add frequently used chord form as a user chord form in Library. Because you can search it immediately, and it’ll be used in preference if it’ name is match in importing SMF. When user press and hold 1 octave keyboard on Make Tab, decided notes are not cleared. This article is long? No, simply it has many pictures :) Let’s look at the step-by-step. Type G/F in Chord Name field, and press Done. Tap b button (if need), G than Gb will to come earlier. Piano Kit 3.4 ignore bass, so you can find G immediately. Tap 5 in right position. You create G/F on the basis of the chord form. 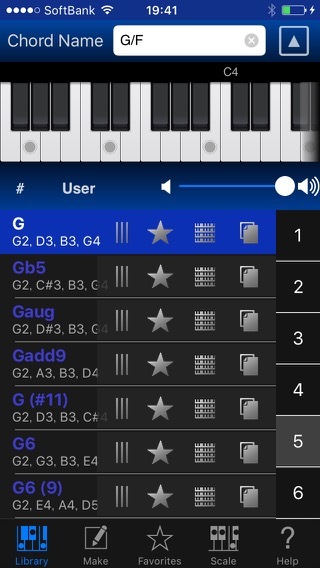 Tap most right Duplicate button on cell G.
Now you’ll see that same chord form is selected on Make Tab. Because chord G doesn’t contain F, press and hold F note in upper 1 octave keyboard. 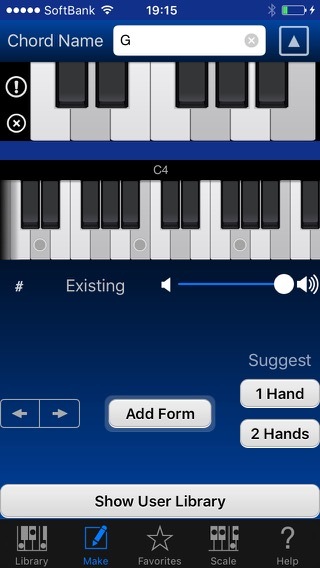 If you tap normally in 1 octave keyboard, middle 4 octave keyboard will be cleared. But it remains if you press and hold. Scroll 4 octave keyboard to the left, and add by tapping F beside bottom G.
Then, you clear by tapping G there was originally. Now, the chord form that you want to add is completed. Guess Chord Name by tapping ” ! ” button. 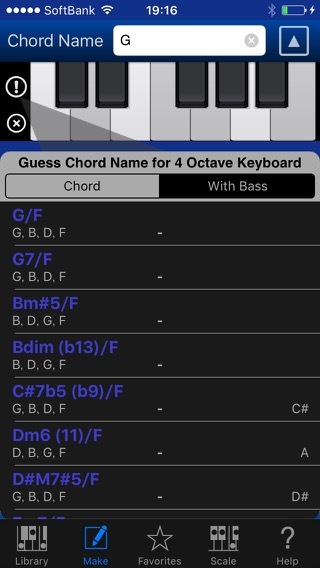 When you tap “with Bass”, Guess Chord Name function propose chord names of the case which is bass note on the bottom note of current 4 octave keyboard. 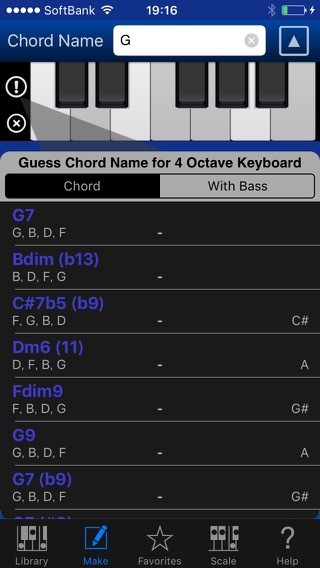 Change chord name to G/F by tapping. 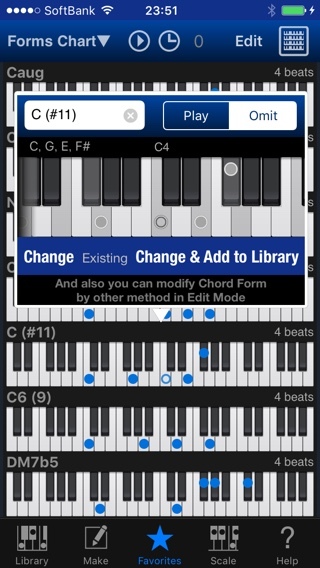 There is no change about chord name, so simply tap “+” button. User chord form has been added. Returning to Library Tab. 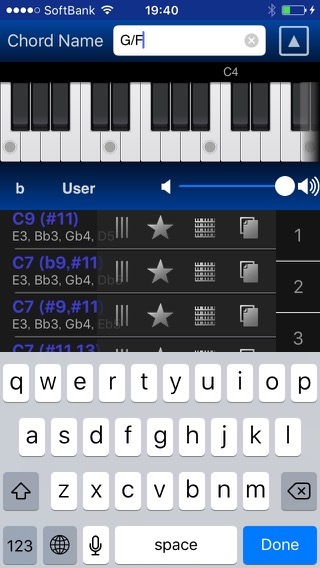 When you tap “User” button, you can see the chord form with bass you added. This feature will be also added to Guitar Kit currently in development. And, at the time of searching in the Library tab in the future version of Piano Kit and Guitar Kit, you will be able to choose whether to ignore the bass. 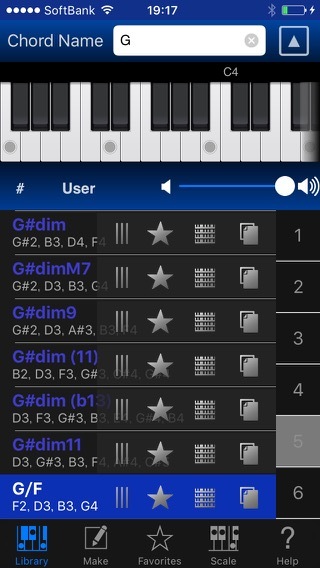 Piano Kit 3.4 has released! 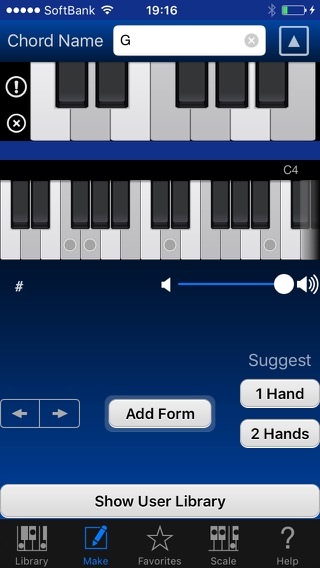 It’s a great Piano Chord Form app for iOS. Included various changes.